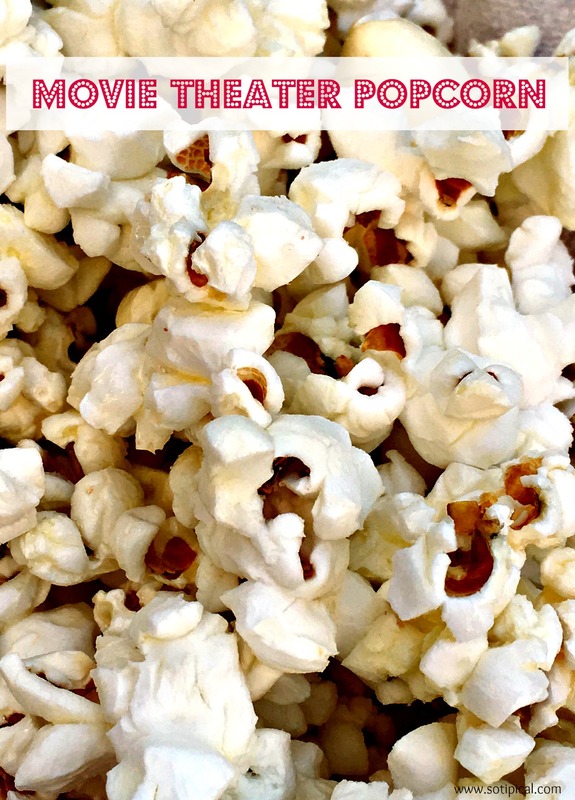 You can enjoy Movie Theater Popcorn at home and it is SO EASY to make! 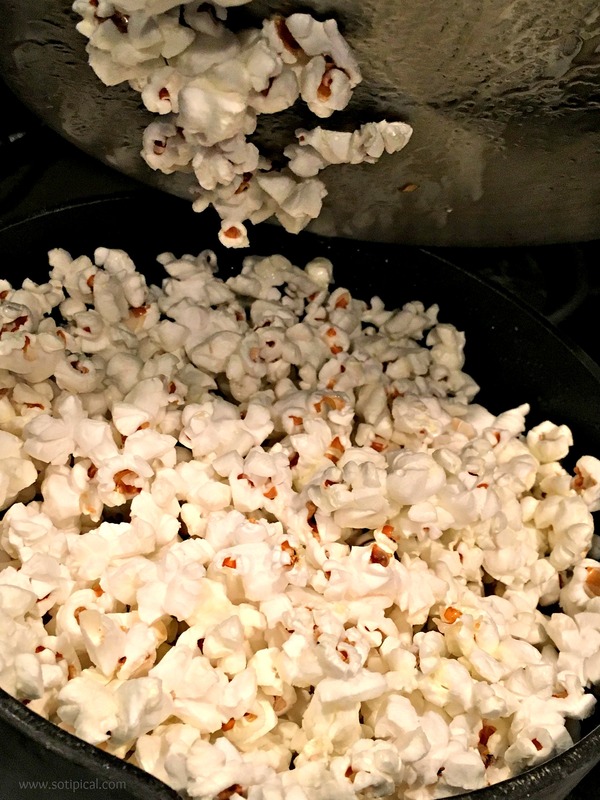 I’ve been making this popcorn for years and it is our family’s favorite! There is never leftovers and I love that I can control what ingredients are being used to make it and so can you! Begin by measuring out 1/3 cup popcorn kernels. I use an old, heavy 2 1/2 quart pot that has a lid. You can certainly use a larger pot, but this is the size I use 95% of the time. Add just enough oil to coat the bottom of the pan. I use olive oil, but you can use coconut, vegetable, sunflower, etc. This equates to roughly 2 tablespoons. You can use a little more if your pan is larger. Make sure the whole bottom is coated. 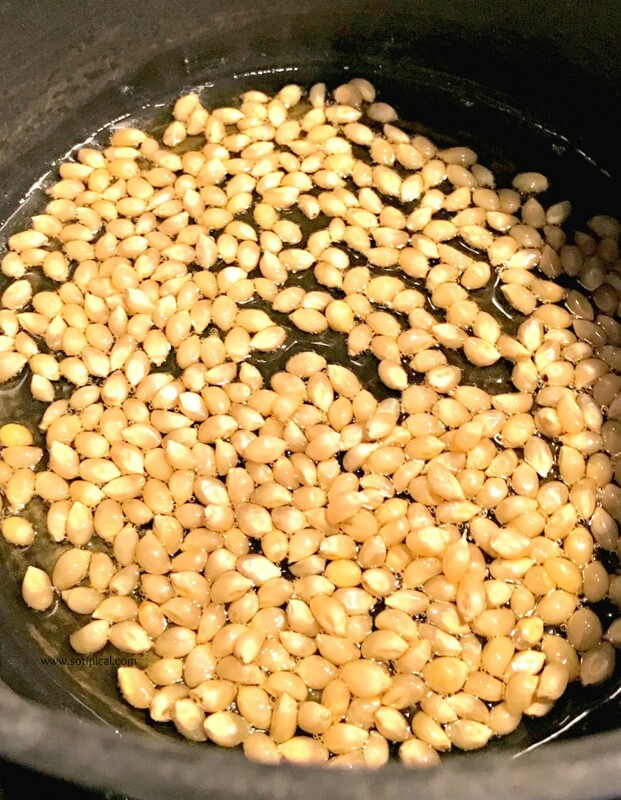 Place pot over medium-high heat for about a minute, then add the 1/3 cup of kernels. Place the lid on top and allow to heat. After about 30 seconds, start “shaking” the pan on the burner. This helps the kernels to move around and prevent burning. I don’t recommend leaving the pot unattended for more than 15-30 second intervals, if necessary. 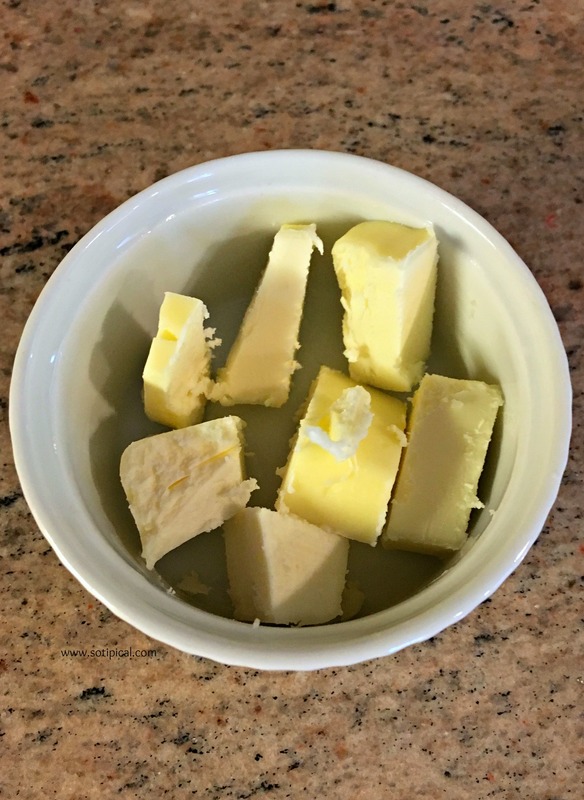 Here I cut up about 3 tablespoons of butter, which I melt in the microwave for about 30-60 seconds on the “defrost” setting. Once done, set aside. The popcorn will be done when the popping slows down to about one pop, every few seconds. Don’t leave pot over the heat or it will burn the bottom layer of popcorn. The 1/3 cup of kernels fills my 2 1/2 quart pot to the top with popped popcorn. Now you can add the seasoning of your choice. We use melted butter and sea salt. You can also add flavors like garlic powder, oregano, parmesan, cinnamon & sugar, etc. It is whatever you like. I love buttered popcorn but never get it at the theater. I just don’t like the “butter” that is offered there. Its NOT butter! It is butter-flavored oil! 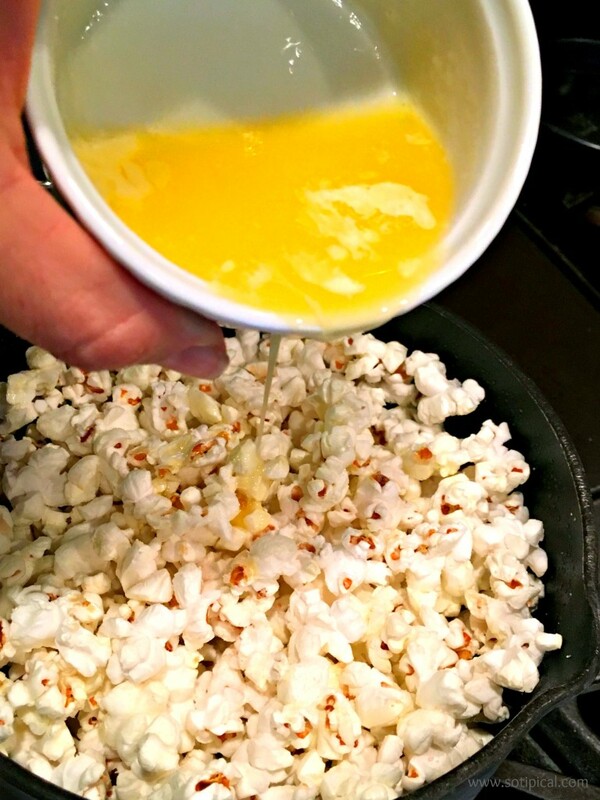 I can’t bring myself to pour this oil all over my movie theater popcorn, but using real butter (and even organic butter or ghee) is even better! Once we add the butter and salt, I give the popcorn a quick stir and serve it immediately. It is SOOOO GOOD! 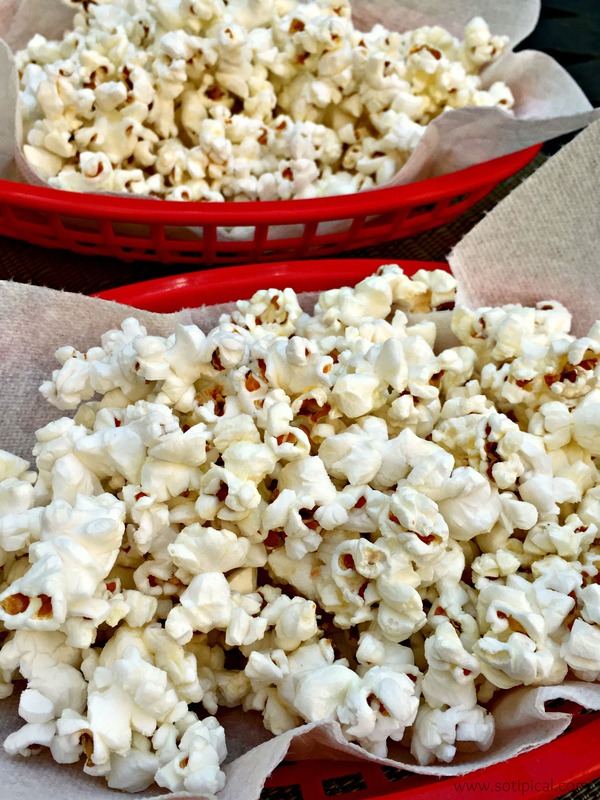 I admit that we used to buy bags of popcorn, but ever since we started making Movie Theater Popcorn at home, bagged popcorn just doesn’t taste so good to us anymore. It is really easy and I promise you will love it! It is also so economical! 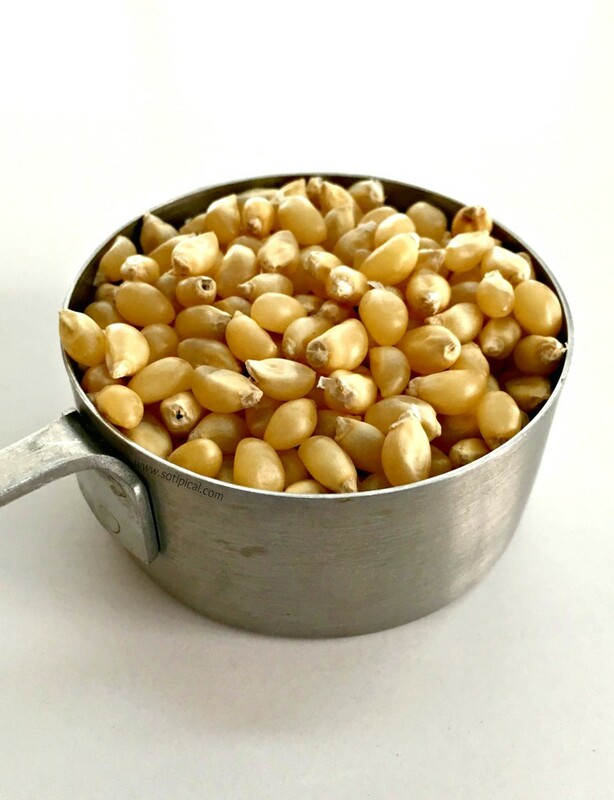 A container of kernels cost under $2. The bag I bought has 28 oz and is organic. Lets do the “math”. 1/3 cup is just less than 3 oz. This means I can make at least 9 pots of popcorn with that $1.99 bag of kernels. How much was the last popcorn you bought at the theater? Like $5+, right?! I would much rather make this at home! I have heard that you can coat kernels in a little oil, then put them in a brown lunch sack to make your own “Microwave Popcorn”. I haven’t tried it, but if you do, let me know how it turns out!